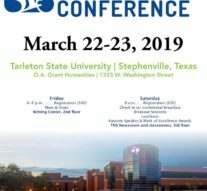 For the second time in two years, Tarleton State University will host the annual Region 8 conference of the Society of Professional Journalists. The region includes campus and professional chapters in Texas and Oklahoma. The event will be held Friday, March 22, and Saturday, March 23. The Tarleton SPJ chapter is the host chapter. The conference took place Tarleton for the first time in 2017. Last year it was at San Antonio College. The conference will be held in the Department of Communication Studies’ Texan News Service newsroom and facilities, which feature a state-of-the-art TV studio, control room, newsroom and media labs. All are located on the third floor of the O.A. Grant Humanities Building. along with the Mark of Excellence student journalism awards luncheon at the Dining Hall upstairs. The luncheon keynote speaker will be Beth Frerking, the new vertical editor at The Dallas Morning News. Frerking is a veteran journalist who worked more than three decades as a reporter, editor and educator in Washington, D.C., before returning to her home state of Texas. Last October, Frerking joined News and oversees a team of 40 editors and reporters in Dallas, Austin and Washington. Frerking’s career in the nation’s capital included stints at The National Law Journal, where she served as editor-in-chief beginning in 2013, and, before that, at Politico. Previously,Frerking directed the Journalism Center on Children & Families, a program of the University of Maryland’s journalism department. She joined the center after reporting for nearly a decade as a national correspondent for Newhouse News Service. She also previously served as bureau chief and congressional correspondent for The Denver Post and a reporter for the Dallas Times Herald. The newspaper’s investigative series on air traffic safety following the crash of Delta Flight 191 in August 1985 was a finalist for the Pulitzer Prize in Public Service in 1986. Returning home to Texas in September 2017, Frerking served a brief stint as editor-in-chief of The Rivard Report in San Antonio, a non-profit online news site. Frerking is an honors graduate of the University of Texas at Austin’s School of Journalism, and she served as editor of The Daily Texan. The conference will be dedicated to the memory of Washington Post journalist Jamal Khashoggi, who was murdered last year after he wrote numerous columns critical of the Saudi Arabian regime. Conference speakers include media leaders from throughout Texas and Oklahoma, including three Pulitzer Prize winners – photojournalist Robert Hart, Tarleton Assistant Professor Dan Malone and independent journalist and author David Wood. Hour-long conference sessions will begin at 9:15 a.m. Saturday and continue into the afternoon. They will cover issues such as fake news and how to spot it and combat it; Google tools and Facebook training for journalists; launching careers in TV news reporting and sports reporting; Oklahoma tribal media and their battle for a free press; and covering the military and the aftermath of war. An afternoon wrap-up panel discussion will tackle journalism in the age of Trump and how demonizing journalists as “enemies of the state” is having an impact beyond the Beltway and major mainstream media outlets. Jones Malone pointed out that a 2018 Gallup poll found that 45 percent of Americans have a “great deal” or “fair amount” of trust in the news media, up from a record low of 32 percent in 2016. A Knight Foundation/Gallup survey found that most Americans believe the media still have a crucial role to play in U.S. democracy. Contact: Kathryn Jones Malone, 254-974-0326; jonesmalone@tarleton.edu. « Older Article What is femininity?